You are here: Home / OAN Members / Member Profile: Hopper Bros.
Key people: Denny and Joni Hopper, managing owners. The Farwest Show is widely known as a truly green trade show, full of lush material, but Hopper Bros. always has one of the greenest spaces on the floor. The booth isn’t hard to find. Just look for lots of big trees. 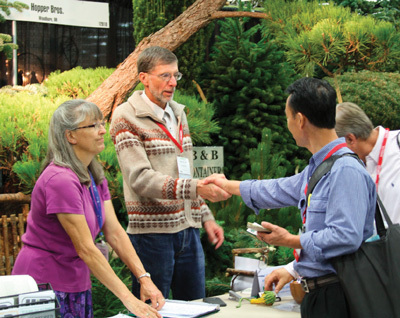 The nursery fills its 30-foot by 10-foot mid-row space (Booths 12010, 12012, and 12014) with plenty of big firs, pines and other conifers — some conventionally shaped, others sculpted. In fact, the booth is so densely packed that there isn’t room for much else. Although this mass of plant material is impressive, the grower leaves its largest material at home. That’s a necessity, given they grow specimens up to 22 feet tall. For those looking for something a little smaller, the nursery also offers liners and plugs. Stewardship is the main principle by which Hopper Bros. does business. “Take care of the ground, take care of your customers, and don’t let AR [accounts receivable] get too far out of hand,” managing owner Denny Hopper said. Over the long haul, the diversity and adaptability has helped steady the company’s financial footing against the inevitable ups and downs that come with each segment of agriculture. All told, the company’s operations take up close to 900 acres of owned and rented land. The nursery products are propagated by seed, cuttings and grafting, and sold B&B, as well as potted to order. They are shipped to the Eastern U.S., the Midwest, and California. The Christmas trees are also sold into those regions, when not exported to Asia. Most of the trees go to Singapore, Korea and Japan. Some of their grafted liners also go overseas. “We sold some liners to Japan and Korea this year,” said Denny’s wife, Joni, who is in charge of the nursery’s sales and marketing. Denny Hopper grew up with a farming background. His parents farmed. Both sets of grandparents farmed. Three sets of great-grandparents farmed. Some of his ancestors homesteaded in Iowa and Montana. Some traveled the Oregon Trail and settled in Oregon. Following high school, he attended community college and earned his associate’s degree in agribusiness. With this knowledge under his belt, Denny founded Hopper Bros. in 1973, along with his brother, Doug (now retired). 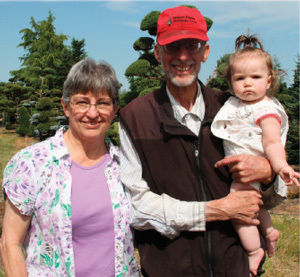 They began their company on a property east of Woodburn, Oregon that their grandparents had farmed. Initially, the brothers grew grain and seed crops, and also raised hogs for the meat packing industry. The company quickly diversified into Christmas trees as well as row crops. Those included beans, cabbage, cauliflower, cucumbers, strawberries and sweet corn. By the 1980s, Christmas trees were in long supply on the market, so the brothers founded a separate business called Hopper Bros. Christmas Trees in California to sell their excess trees at retail locally. Around this time, the brothers received advice from a friend, Loy Russell, who founded and operated Russell’s Nursery. Eventually, they did figure it out. Around the same time, new customers started asking if the brothers’ various Christmas tree varieties — Nordmann fir, Colorado blue spruce and others — could be dug and purchased B&B. The Hoppers initially had to rely on borrowed laborers and advice from friend Bill Peters and Peters Meridian Nursery to dig all the trees. 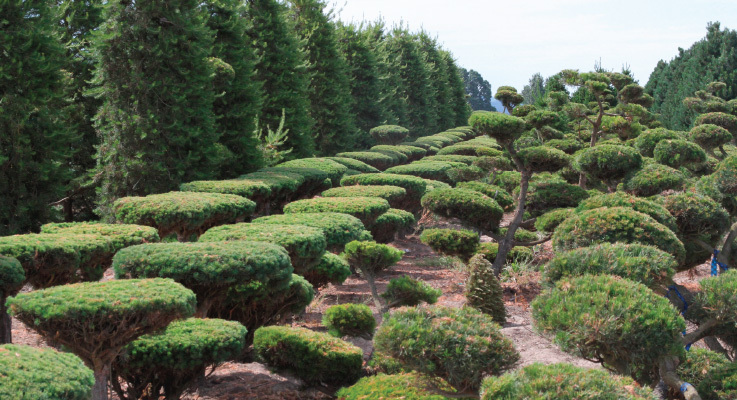 The nursery expanded its offerings for a while to include boxwoods and birches, but refocused on conifers. The Great Recession harmed the nursery starting in 2008. Sales dropped by 75 percent and the workforce had to be cut back. “Our strategy was in diversification, but the Christmas tree market was in a long down cycle oversupply, and then the recession just piled on top of that, and expanded that down cycle of Christmas trees,” Denny said. As part of a recovery attempt, the company rented additional acreage for specialty seed crops and row crops, then endured three years of disasters, with freezes and untimely rains. However, through hard work, they made it through the recession. Today, the farm operates on 900 acres, including 80 acres in nursery production, 100 in Christmas tree production, 200 acres of grass seed (mainly fescue and ryegrass) and the rest in pumpkins and row crops. Organic vegetables are a growth area for the company, including corn, beans and squash. Nursery sales are brisk and Christmas tree sales are strong, too. Denny and Joni are joined these days on the farm by their son, Russel. Their other son, Ryan, works for Peterson Cat, but helps out on the weekends. Together, they will continue to look at opportunities as the market presents them. of Digger. He can be reached at ckipp@oan.org or 503-582-2008.